Most mornings I drink my coffee black, but every once in a while I’m in the mood for a “fancy” coffee drink. This isn’t quite as strong as a vanilla latte at your favorite coffee house. If that’s your drink, use some instant espresso powder instead. This reminds me of the little containers of instant french vanilla coffee you can get at the grocery store. Very yummy. I also like to use decaf coffee and have a cup of this for dessert at night. Measure all of the ingredients into a clean, dry bowl. Use a fork to combine everything evenly. If you are ambitious, you can powder everything in a blender. I don’t always do this because I am lazy. You do get really impressive results from it though, and it is easier to do than one would expect. Transfer the mixture to a resealable container, or a pretty jar. This makes a good gift, especially in the winter time. I invented this recipe because I couldn’t find powdered vanilla flavorings. The closest I could come was French vanilla pudding mix. After I made this recipe, and then tried it, I was amazed at how smooth and creamy it was. Also, all of the powder dissolved when I stirred it. I didn’t find the normal “sludge” of undissolved mix at the bottom of my cup. It turns out that the pudding mix has chemicals added to it to make powders dissolve completely with only a little bit of stirring. Since then, I have included pudding powder in many of my coffee and cocoa drink mixes. It really improves the finished product a lot. When store-brand pudding mixes can be purchase 2 or 3/$1 it is a pretty cheap way to make hot drink mixes into something really special. In some of the recipes the pudding mix is optional. If you prefer not to chance adding the chemicals to your family’s diet, then they can be omitted. 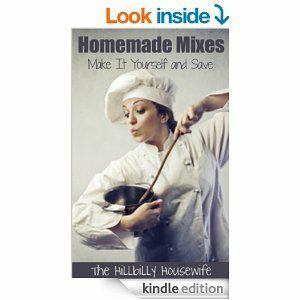 I’ve also seen organic pudding mixes that look like they would probably work in this type of recipe too. If you find any at your local natural foods store, give it a try and let me know about your results. 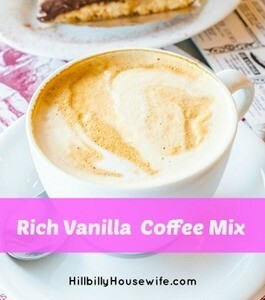 How about another yummy coffee mix recipe? Try this Mocha Espresso Coffee Mix.